Here is how to reset your printers on-board filament measurement. Don't be alarmed, this is the printer simply thinking it's run out of filament. In the image below, you can see the 'Material' section. In here we have 'Type'- The type of material we're printing, most likely PLA. We also have 'Weight'- The weight of material left, and we also have 'History'- How much filament the printer has used over it's lifetime. To fix the error, you'll need to type in the weight of the roll of filament (new rolls are 500 grams). 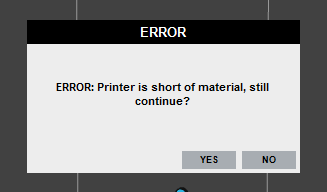 Then simply click 'Confirm' and the printer knows it has another 500 grams to work with. If you're putting in an already used spool, you can type in 500 grams and you may just need to keep an eye on how much filament is left. It's not that important in the UP! 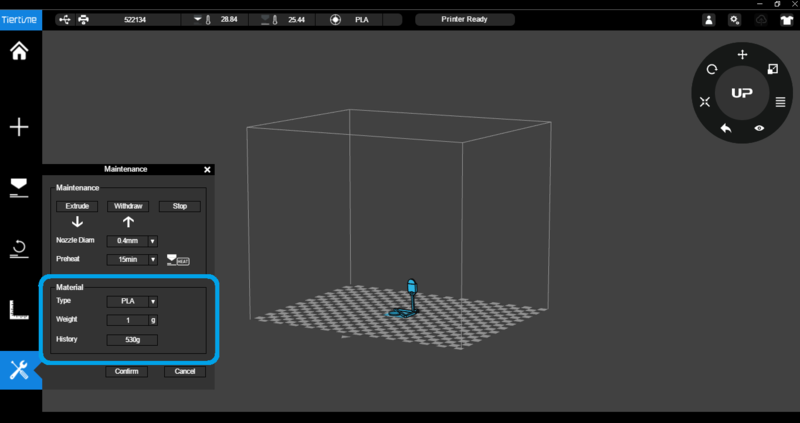 Box+ as it has filament detection. Ie. it can actually tell you when it physically runs out of filament.